Let me just say up front: Colorado law gives me criminal and civil immunity from prosecution should I decide to use deadly force in the event of a home invasion. In a home invasion scenario, I will take full advantage of the legal protections afforded to me by law. The main objective of any self-defense method is to stop the attack, and my philosophy is to stop the attack and protect my family by the most effective means available to me at the time. For me, that method of self-defense includes having ready firearms, being trained to use them, and then employ them where needed. But not all people are comfortable having firearms in their homes, and not everyone is comfortable shooting firearms. That is fine. The methods that are right for me are not necessarily the methods that are right for others, and I respect that. I wrote an article a while back on "Principles versus Tactics" to explain that you have to decide what you are willing to do in a particular situation, then for you to decide how you will accomplish that. It is also important that I maintain my training and proficiency in my primary self-defense tool as well as a variety of other self-defense methods that I may need to employ to stop an attack. It is not always time or cost effective to schedule trips to the range to expend live ammunition. There are a variety of training methods out there that I use, including dry firing with the LASR App System, and using non-lethal projectile shooting tools such as paintball to help build the muscle memory involved in firearms operation, and that allows you to actually practice tactics with moving targets in a safe environment. There are many other self-defense and training tools out there, but in my testing, I have found one in particular that I am writing about today offers both a good training tool and a good home defense tool, especially for folks who just aren't comfortable with having firearms in their homes. When it comes to training for tactics, having the ability to shoot at moving targets, and in return being shot at by moving targets offers more realism into actual scenarios that you may encounter. This is a type of training often referred to as "force on force" training and is more effective at helping you to learn tactics and gun handling skills under pressure than simply shooting at static targets. The type of training tools to achieve the desired proficiency outcomes is an important aspect to consider, however. Whereas airsoft tends to use guns that emulate actual weapons functionality, such as forcing you to perform magazine changes, they offer little, in comparison to paintball, in the "pain" incentive to force you to be more tactfully minded to prevent from being shot. While I have found airsoft to be a great training tool for indoor close quarters training, paintball offers a more fast-paced alternative to outdoor and longer range scenarios. Since the incentive "not to get shot" is higher with paintball, the "stress inoculation" component obtained provides a more realistic force on force training as well. Putting on my prepper hat for a moment: Being able to train with your family, members of a team that you are prepping with, or even just the people you work with has its benefits also. Paintball fields seem to be popping up all over the place. Here in Colorado, "woodsball" is a very popular activity, as we have our beautiful mountains and forests in which to play games, and those areas offer a wide variety of terrains and scenarios. Grab your bio-degradable paintball ammo and head for the hills! Paintball has become very popular for families and groups to include as part of a camping trip, as well as for groups of co-workers to plan team-building events. In my recent testing, I have been quite impressed with the types of non-lethal self-defense paintball ammunition on the market today. In addition to regular paintballs, you can also purchase pepper balls that contain pepper spray, hard rubber balls, PVC nylon balls, and even glass balls containing iron dust for use in paintball guns as a self-defense tool. In my testing with various materials used as targets, I have seen the PVC Riot Balls, for example, cause enough damage on multiple thicknesses of heavy cardboard and drywall to be very plausible as a self-defense method. I am awaiting a shipment from Bulls Breaker Balls in South Africa so that I can test their latest product, but my research so far indicates that that product has promise as a self-defense ammunition as well. Hands down, the Tippmann A5 is my personal recommendation. The Tippmann A5 is sort of the "Ruger 10/22" of the paintball gun world in that accessories, modifications, air supply variations, upgrades, and spare parts are so plentiful and widely marketed, that this gun can be personalized very easily. This gun is extremely easy to work on and maintain, and there are a plethora of YouTube videos out there to give you advice and instruction. I also prefer the Tippmann A5 simply because of the "Cyclone" feed system that has shown to be extremely reliable, and saves the expense of having to buy an add-on electric hopper, or some other feeding system, ta make the gun run consistently and reliably. The Tippmann A5 also uses the larger 20+ oz CO2 and 3,000psi High-Pressure Air (HPA) supplies, which allows for larger capacities and more shots. Reusable CO2 canisters are relatively inexpensive to purchase and fill, and fairly easy to find refill stations. HPA refill equipment is becoming more readily available and inexpensive, and HPA is said to actually be better on paintball gun internals and more consistently shooting in a variety of environmental conditions (temperatures) than CO2. 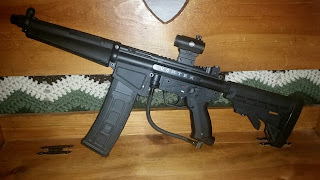 My home-defense Tippmann A5 is modified with a buttstock, red dot sight, Vortex magazine conversion kit, and Flatline Barrel. The magazine conversion is inexpensive and was very simple to install. Instead of a hopper that is now in the way, I have the ability to load 20-round magazines with a variety of ammunition types. I have the red dot sight set up for very close engagements, zeroed for 21 feet, a typical distance of encounter within my home. I have the velocity set at around 300fps, which is enough velocity to be effective, but yet low enough to help prolong the life of the gun internal valves and o-rings. The CO2 supply is a 24oz external cylinder that is screwed in, but not fully, so as to prevent leakages, but still be on the gun so that it can be quickly screwed in the remaining turn or two to fully charge the gun when needed. The ready condition of this gun also includes a fully loaded magazine in the gun and four spare fully loaded magazines nearby. For those of you who prefer more of a "handgun" type of platform, there are two front-runners out there. The Tippmann TiPX, and the Tiberius T8.1. In fact, the Tippmann TiPX is used as the manufacturing model for the SALT Supply Pepper Gun, as those models are actually manufactured by Tippmann, and then sold as a self-defense weapon. Both the Tippmann and Tiberius are .68 caliber paintball guns, an important factor when choosing a caliber for your paintball ammunition. 68 caliber is the most readily available when choosing actual self-defense rounds, and it has more capability as a self-defense caliber (in my humble opinion) than the smaller paintball calibers. Both also use the smaller 12-gram CO2 cartridge for the air supply. These cartridges are very inexpensive to buy in large quantities but have very limited capacity when shooting. I recommend the handgun platform as a backup, but not as a primary defense tool. My personal preference (for the handgun platform) is the Tiberius T8.1. The main reason I chose the Tiberius model is because the CO2 cartridge and the paintball rounds are both contained within the magazine. That means that will very magazine reload, you are getting a fresh CO2 canister as well as more ammunition. These paintball pistols only fire 10 or so rounds per paintballs CO2 cartridge, so being able to quickly reload both ammunition and CO2 quickly is extremely important in a self-defense scenario. I also chose the Tiberius model because it comes ready to go out of the box with the ability to load and shoot the new "First Strike" shaped paintball rounds, which come in both paint and solid self-defense rounds. Airsoft guns are NOT self-defense tools. Period. They may offer a half-second distraction so that you can flee and go find another weapon, but they will not stop an attack. There is a chance that brandishing that airsoft gun will give the bad guys pause, but they will soon see that orange tip and know that you do not have the ability to do them any harm at that particular moment. Other air guns, such as pellet guns, may have the ability to cause minor injury or a momentary distraction, but again (in my humble opinion), pellet guns just are not made to be self-defense tools. There are varying opinions about that out there, certainly, the video below explains some ideas on the subject. I believe in firearms as the most effective defensive measure in the event of a home invasion. Period! Violent criminals only understand one thing: Force. 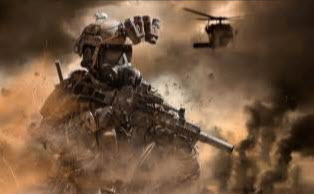 Speed, surprise, violence of action, and a determination to win will help you prevail against evil. I always have a firearm at the ready at various places in my home and am ready to employ the firearms as a defensive measure all the time, but I also have non-lethal tools such as pepper spray and paintball guns that I see as viable options in home defense scenarios. Not everyone is comfortable with having firearms in their homes and would like a non-lethal measure to stop or at least slow down an attack. Paintball guns offer a viable self-defense alternative, in my opinion. There are a variety of inexpensive and reliable paintball guns out there, including the Tippmann A5 and Tiberius T8.1 guns, that can easily be adapted and customized for home defense use. But whatever tool or tactic you choose, you must be familiar with the operation and maintenance of that tool, be familiar with its capabilities, and above all practice using them in order to be effective.